The organic percentage is influenced by between-catalog cannibalization. More important, the organic percentage is influenced by your online and mobile channels. When you execute your mail / holdout tests (you execute these, right? ), you learn four things. Most of the demand captured at your call center is generated by catalogs - without the catalogs, you don't generate the demand. Usually 20% +/- of call center demand is organic - and 80% is caused by catalog mailings. E-commerce demand (excluding email marketing) is about 50% organic and 50% caused by catalog marketing. This is the mystery of our time ... few people actually measure this and fewer people understand what it means when half of online demand happens without catalogs. This means freedom ... it means your business has a path forward, and you can save a ton of ad cost and reinvested it elsewhere (or pocket it and make your CFO happy). Mobile demand is often 80% organic and 20% catalog driven. As the customer gets younger and/or the customer is two channels removed from catalog marketing, the customer exhibits different behaviors, behaviors that are not influenced by catalogs. Again, this means freedom ... it means your business has a path forward, and you can save a ton of ad cost and reinvest it elsewhere (or pocket it and make your CFO happy). Email Marketing demand is often 95% organic and 5% catalog driven. Why does your catalog matter when you send the customer a daily email marketing message? Get rid of your catalogs (via tests) and watch carefully how the customer shifts to email marketing. It doesn't happen overnight. But six months later or nine months later, the shift is clear. Again, this means freedom ... it means your business has a path forward, and you can save a ton of ad cost and reinvest it elsewhere (or pocket it and make your CFO happy). I spent more than a decade communicating these facts to you. The facts represent an important part of circulation theory. Much of what I'm sharing with you was learned not in catalog marketing, but in sorghum tests I analyzed at the Garst Seed Company ... in 1989. The same concepts applied to the ways that sorghum hybrids grew, and were measured via reasonably simple tests - the same kinds of tests that you measure today. I've shared these facts with you for more than a decade, for free. I've given you a path to the future. How many of you have taken advantage of free advice? Tomorrow I'll show you why the organic percentage is so darn important, ok? One more week of Circulation Theory ... if you find this stuff to be too "circa-1991", then why not watch this video about shipping as a competitive advantage (click here). We have an industry that doesn't want to understand the very thing that allows the industry to be much more profitable and, therefore, able to invest in the future. What am I talking about? The organic percentage, of course. The organic percentage is the share of demand that still happens when you stop mailing catalogs. Every one of you measures your organic percentage (especially if you stopped all email campaigns if you are an e-commerce wizard), right? There are two pieces to the organic percentage. The first piece is inter-catalog cannibalization. Here's how this works. You have three catalogs, mailed April 1, April 22, and May 14. You execute a test - you cut out the April 22 in-home date and measure what happens when you have catalogs mailed on April 1 and May 14 vs. mailing three catalogs. Let's assume that each catalog costs $0.80 and 40% of sales flow through to profit. Total Profit = $15.00*0.4 - $0.80*3 = $3.60. Total Profit = $13.50*0.4 - $0.80*2 = $3.80. Which group generates more profit? The group mailed two catalogs generates more profit. And yet, 9 in 10 readers prefer the outcome that is less profitable ... "WE GENERATE MORE SALES IF WE MAIL MORE CATALOGS!!". In this case, (6.75 - 5.00 + 6.75 - 5.00) / 5.00 = 70% of the value of the second mailing is organic ... it will happen if that mailing does not exist. 70% of the demand will happen if that catalog is not mailed. You measure that metric, right? Tomorrow, we'll talk about the second component of the organic percentage. Here was our profit table from yesterday. My homework assignment was this ... what is the right strategy for this in-home date? It should be difficult to answer this question, for obvious reasons. What is the best strategy for Segment 1? 160 pages. What is the best strategy for Segment 2? 128 pages. What is the best strategy for Segment 3? 128 pages. What is the best strategy for Segment 4? 96 pages. What is the best strategy for Segments 5-10? 32 pages. What is the best strategy for this company? If you talk to somebody from Xerox, they'll tell you to create every version of the catalog, paginated based on customer merchandise preferences ... creating thousands of different versions. And they would be right. But you're not going to do that, because you want to accurately forecast demand at an item-level so that your inventory buys are appropriate (even though you can forecast accurately online where you have no control over what the customer looks at). And you are unlikely to create multiple versions of a catalog, even though the data is telling you that's exactly what you must do - because that creates added complexity and you don't have the staff to handle added complexity. Your paper rep and your printer are going to tell you to go with a large page count because of various vendor discounts/incentives. Your co-op rep, however, should be strenuously screaming at you to go with a small page count because you will mail many more prospects and the co-op will make a ton of money in the process. Yes - your paper/printer partners and your co-op partners are at complete odds ... when one partner wins, the other partner potentially loses. This is a secret I'm not even certain the co-ops understand ... but if they were smart, they'd be running circulation grids for you and they'd be screaming at you to go with low page counts. As an industry, catalogers tend to align with their paper partners - the USPS and various Printers tell you that you are "saving" money by going with larger page counts. But the table above clearly indicates that by "saving" money you reduce circulation. What happens when you reduce circulation? What is the most important aspect of marketing a catalog brand? Reactivating customers and Acquiring customers. So now we have a bunch of conflicting factors at play. Your paper partners give incentives to have large page counts, but are fine with small page counts mailed to many people. The USPS gives incentives to have large page counts. Your co-op and list partners profit when you have small page counts. Xerox wants you to have 80,000 versions of a catalog. Your staff can only handle one or at most two versions of a catalog. Your best customers want many pages. 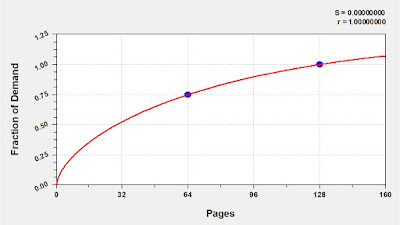 Your marginal customers and prospects are unprofitable at large page counts. 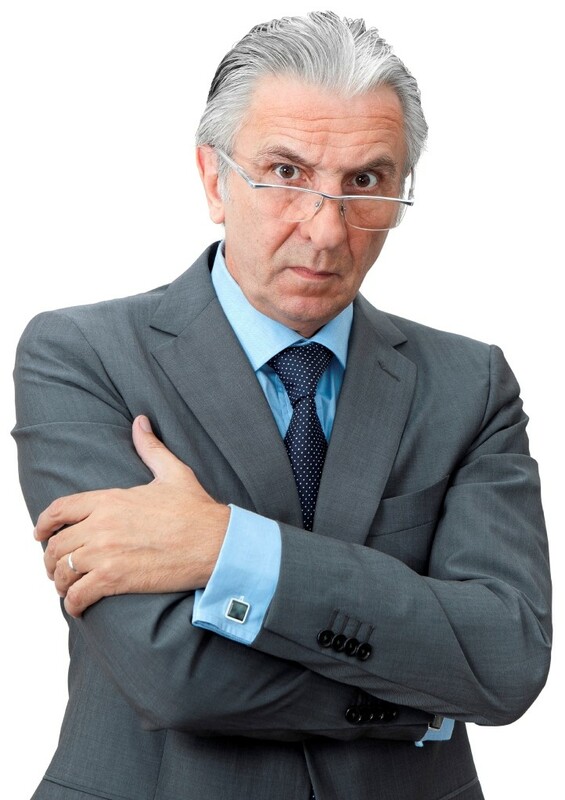 Your CFO is yelling at you to increase demand and increase profit, which is impossible with only one version of a catalog. As an industry, we're being pushed toward lower page counts - this is unavoidable. We're competing against digital strategies executed in real-time - you cannot compete by tossing large page counts out there that require six months of planning. Those days are over. Your online customers cannot support large page counts (as their organic percentage is high, thereby pushing them into Segments 7-10 in our example above). 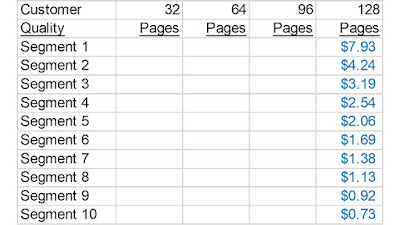 And as the table shows us, large page counts ruin prospecting efforts ... the most important part of being a cataloger (prospecting) is sub-optimized by a lust for large page counts. So we have no choice but to move to smaller page counts. But what about the meaty levels of profit generated at large page counts by best customers? Here's how you work around this issue. You alternate strategies. In-Home #1 = Large Page Counts, mailed only to best customers. This catalog has your full assortment of new merchandise. Your best customers pay for sub-optimal new items. By sending this only to your best customers, you avoid all of the losses that happen with marginal customers who don't spend enough on marginal merchandise to generate profit. In-Home #2 = Small Page Counts, mailed as deep as you can humanly mail the small catalog. The catalog is absolutely stuffed with only winning items - with callouts to look at new/marginal items online. This is where you do all of your prospecting and reactivation work. If you do this, you get a lot of benefit with minimal compromise. Your paper partners are happy because you mail a large page count book shallow and a small page count book deep. Your co-op and list partners are happy because you spend a ton with them on alternating prospect-heavy mailings. 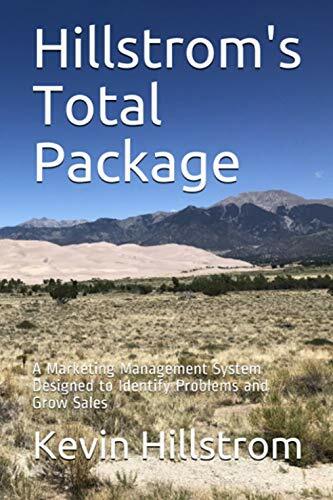 Your CFO is happy because you generate a ton of profit from your best customers on large page counts and you increase prospecting efforts which generate a ton of profit for you next year. Your staff is happy because they don't have to come up with inventory plans for 80,000 personalized versions of a catalog. You are happy because you ran the simulations and you know what the right thing to do is. This doesn't have to be difficult. Alternate your strategies. Large mailings sent only to best customers chocked full of new merchandise ... and then very small mailings sent deep into your file (and to prospects) stuffed with winning products and winning creative (to push productivity as high as possible to push circulation as deep as possible). Need help figuring out what is right for your business? Email me (kevinh@minethatdata.com) and we'll figure it out together. Yesterday we came up with our circulation grid ... predictions for each page count and circulation depth cell. Then I gave you cost and profit data. Cost of a 32 page catalog = $0.26 each. Cost of a 64 page catalog = $0.45 each. Cost of a 96 page catalog = $0.59 each. 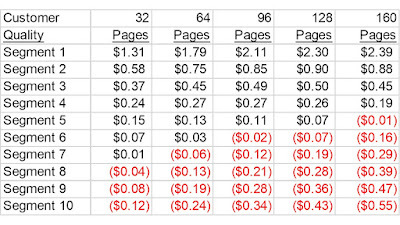 Cost of a 128 page catalog = $0.71 each. Cost of a 160 page catalog = $0.85 each. 38% of your $-per-book converts to profit. With this information, I asked you to calculate profit for every cell ... which of course is a straight-forward exercise. This is the process that smart companies go through to know what the best strategy is for any in-home date. We had these grids for our mailings at Eddie Bauer way back in 1998 ... two decades ago for crying out loud!! 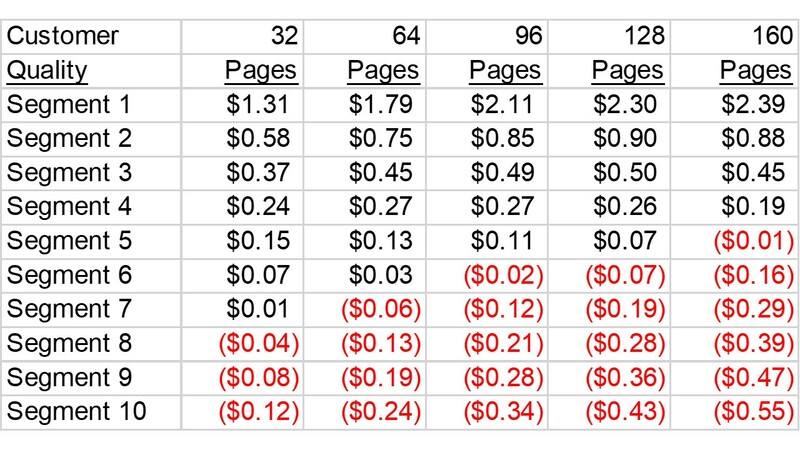 Ok, let's offer you one final quiz question ... which mailing strategy is "right", based on the dollar-per-book table and the profit table? 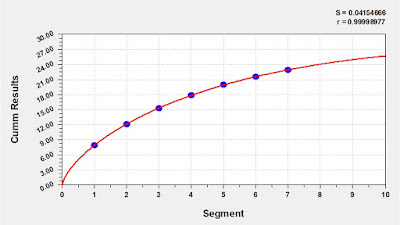 Strong hint - the answer should not be straighforward, and if you think the answer is straightforward, spend more time thinking about what the data tells you!! Ok, yesterday we filled in the 128 page portion of the table. Now, you performed a test, and you learned that a 64 page catalog generated 75% of the demand of a 128 page catalog. Given that information, fill in the rest of the grid ... for a 32 page catalog ... a 64 page catalog ... and a 96 page catalog. What did you learn when you performed the exercise? I fit an equation ... I have three data points. The equation creates a relationship that looks like this. 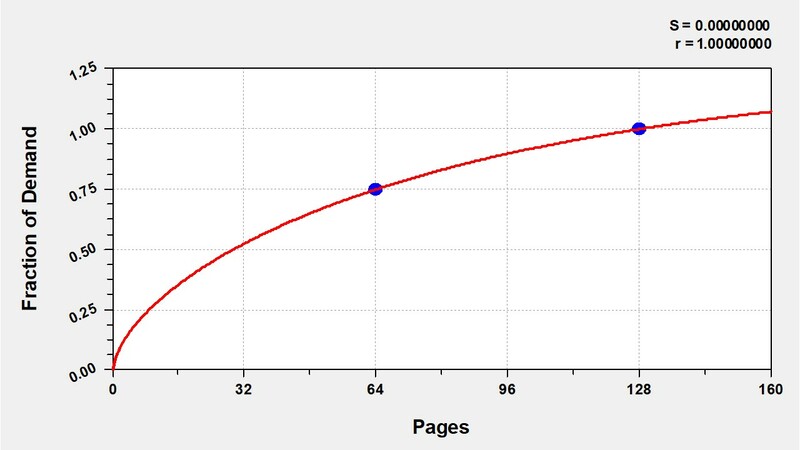 With this relationship, I can forecast the fraction of demand at each page count. Did you see what I did there? I added in 160 pages, just for the fun of it! Now I can fill my grid in. Take a look. We almost have something interesting, don't we? Let me give you additional data. Given the cost/profit estimates and the dollar-per-book estimates above, tell me what profit is for every page count / segment mailing combination. That's your homework assignment for tomorrow. If you don't like Circulation Theory, then click on this article and ask yourself how hard it would be for your brand to create a low-cost / no-cost customer acquisition program giving away eclipse glasses? Recall our table from yesterday? I asked you to predict what you might see if you mailed Segment 8, Segment 9, and Segment 10. I like to "cumm" results and then fit a line to cumm'd results. The relationship looks something like this. 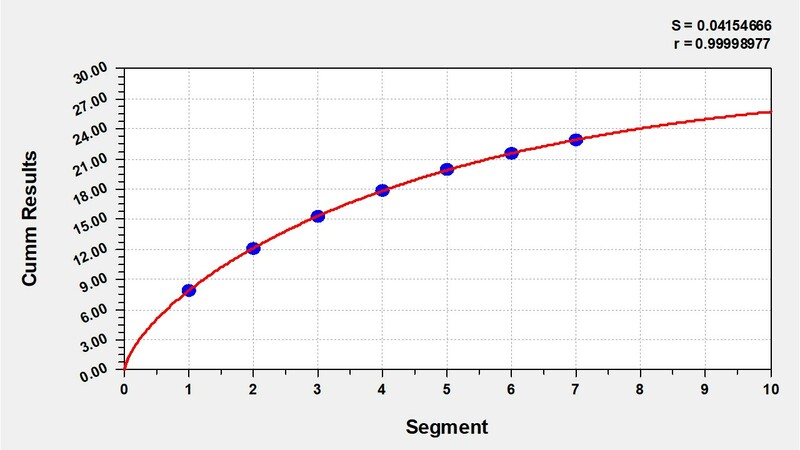 With cumm'd results, I then subtract the difference ... the prediction for Segment 8 in the graph minus the prediction for Segment 7 yields the dollar per book for Segment 8. In fact, I'll do that for every data point - which allows me to smooth out the problems with noisy actual results (the relationship between Segments 3/4/5 isn't quite perfect due to noise, for instance). This leaves me with the following table. Just like that, I have a reasonable prediction for each segment, with the noise smoothed out! 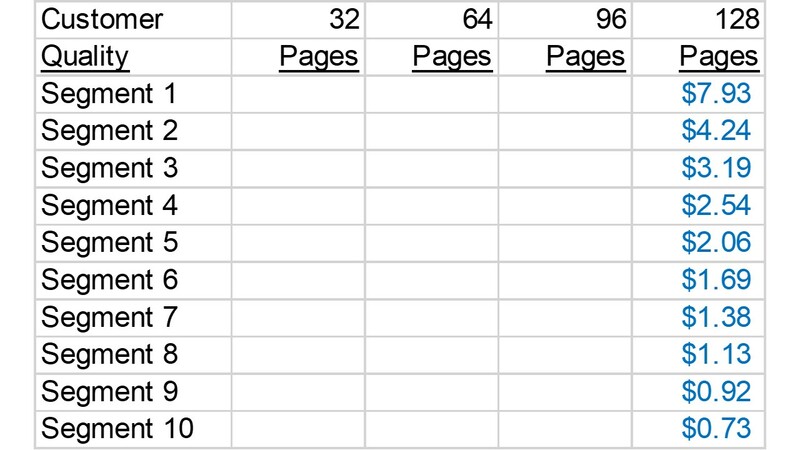 Ok - here's your quiz question for tomorrow ... if you executed a test of a 64 page catalog against the 128 page catalog, and you learned that 64 pages generated 75% of the demand of a 128 page catalog, how would you fill in each of the remaining cells in the grid (for 32 pages, 64 pages, and 96 pages)? Do your homework, and we'll review results tomorrow, ok? Note - if you aren't in the catalog industry, this is a good time to take summer break, because I'm going to spend two weeks discussing Catalog Circulation Theory. I'll see you in two weeks, ok? Or at least read this article about L.L. Bean (click here). See the grid featured here? 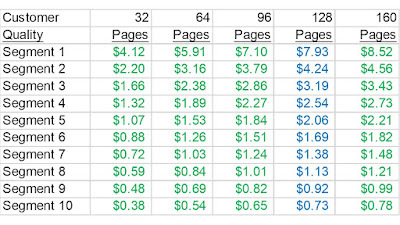 This is the dollar-per-book for a recent catalog via whatever attribution algorithm you like to use. Your homework assignment for tomorrow? 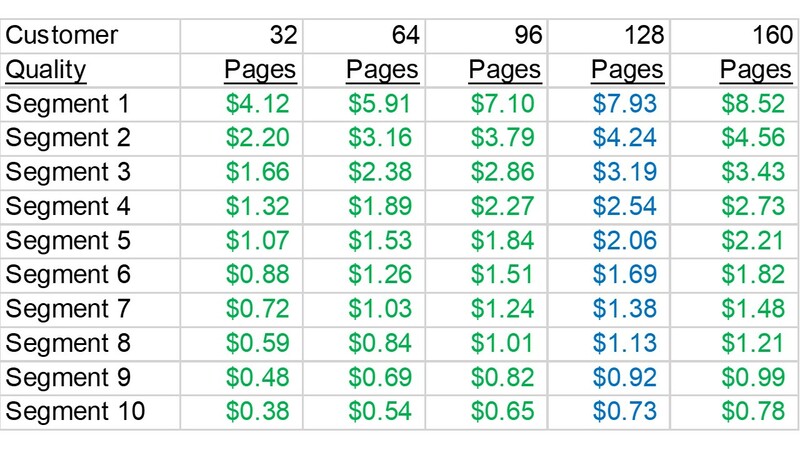 Tell me the dollar per book you'd expect if you were to mail Segment 8, Segment 9, and Segment 10. Fill in your answers, and we'll move the discussion along tomorrow. And hint ... you see the 32 / 64/ 96 / 128 page columns? 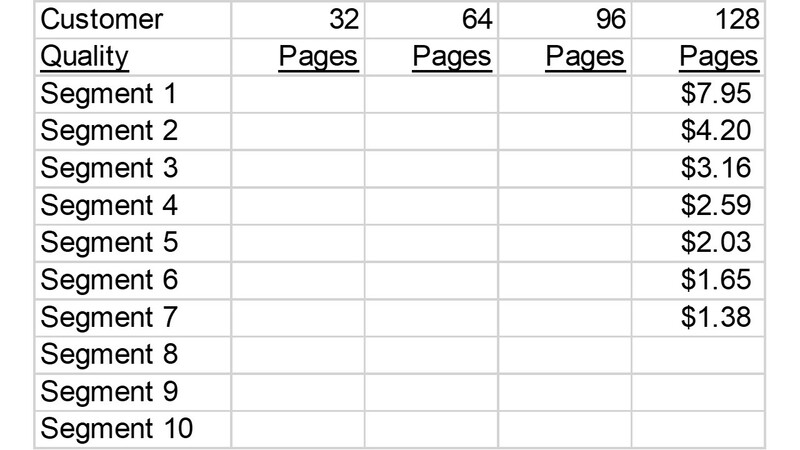 We're eventually going to fill those page count cells in as well. Here's an example (click here). This costs you close-to-nothing. Get a sprinter van, wrap the van in your company logo, and go out there and mingle with the public and do something clever. Or not. Maybe you don't like the idea. No worries. But let's do something! 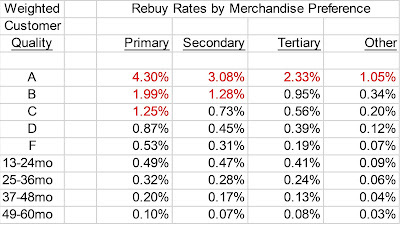 Let's pretend that your annual repurchase rate is 30%. If true, then your marketing resources need to be aligned squarely against the singular goal of finding new customers, correct? I mean, you have to replace 70 of 100 customers every single year, what other conclusion could you come to? Most of my client base possesses an annual repurchase rate under 40% - it's the general nature of catalog marketing and/or e-commerce (retail is different, with higher annual repurchase rates). So most of my client base (and most of my readers) are likely to fall into a situation where finding new customers is easily the most important initiative. At conferences, I'll ask how much time the audience spends trying to get more customers to become more loyal ... and I'll frequently see that the majority of attendees spend the majority of their time trying to get the majority of existing customers to spend more money. In other words, resources are not aligned properly. When I speak of low-cost / no-cost customer acquisition programs, loyalty-driven employees stare like I've got green steam coming out of my ears. There's a good reason for this ... loyalty-driven employees have spent a career honing loyalty-driven skills. As we look to 2018, one might consider if we're aligning resources properly? Frequently, the answer is no. We're in the process of rolling up weaker companies, aren't we (click here)? This book is from 20 years ago, but it is one of my ten favorite books of all time (click here). The authors demonstrate how an industry expands (many new companies), then is rolled-up (big companies buy weaker companies), then innovation happens once the industry is too concentrated. The traditional catalog ecosytem was rolled-up in two stages ... 10-15 years ago the co-ops rolled-up the data ... today a half-dozen companies (+/-) are rolling up brands. This seems to be the way the world works now ... in e-commerce Google+Facebook rolled-up the data, and then retail brands are rolling-up e-commerce brands in response to Amazon owning e-commerce. There are three big trends surrounding businesses that are being "rolled-up". Reduced Fixed and Variable Expenses. Catalogers are being starved of new customers - no two ways about it. If a cataloger is part of a "brand portfolio", there are a ton of customers that can be "accessed" (but not necessarily converted). The standalone cataloger has to have a response when competition is being "rolled up". Low-Cost / No-Cost customer acquisition programs to defeat access to sister brand lists. Greatly reduced catalog marketing expense to free up resources to be invested elsewhere. A strong New Merchandise program designed to protect the future health of the business. The three strategies above are not strategies that a ton of catalogers are focusing on ... which does not bode well for standalone catalogers going forward. We know where we need to expend energies. Let's go do that! When I suggest that commerce must move toward Sports / Politics, many readers grind their teeth in disapproval. Meanwhile, customers happily hop aboard the event train. Look at that ... Nordstrom cardholders get to load up on Fall merchandise at sale prices a week earlier than everybody else. It's like there is an event, and Season Ticket Holders get to "reap the rewards" as the trade journalists like to say. Go ahead, click here to learn more about it. Commerce is aligning more with Sports and Politics as time progresses. What is your monthly/quarterly/annual event that customers cannot possibly miss - and what are you doing to market the event like there is no tomorrow? There's nothing like the thrill of a CHECK ENGINE light to bring your peaceful drive to a haunting close. You make an appointment ... 8:30am ... and you arrive on time. You pull the car up to an expansive six-lane bay where a worker in a blue shirt waves you in to the far left lane. He asked "who is your service advisor?" and you dutifully respond "I think his name is Chet." Within seconds, you've been separated from your car. This really tests your relationship, because there is no loaner car in your future. It's just you and Chet. Chet invites you to sit down at a pseudo-cube and offers you a quenching 16oz bottle of ice-cold water. You tell Chet about your problem - and Chet is really not listening to you because Chet knows that the technician ... Boris ... is going to use a code reader to figure out what is wrong. It simply doesn't matter that you turned the steering wheel a hard left and then a check engine light came on ... your story is irrelevant ... the facts are buried and Boris is going to do what Boris does to solve your problem. After communicating a mandatory $149 fee, you sign three pages of documents and secretly wonder if you just handed over the title of the car to the dealership? At this point, you are graciously walked over to the customer lounge. What a place! There is an assortment of apples and bananas to choose from, more free ice-cold plastic-bottled water, and the opportunity to take in a half-hour of insight courtesy of Matt Lauer on the giant 68 inch LED television. Ronaldo sits down next to a fifty-ish woman. He has a sheet with seventy-nine categories coded green, yellow, and red ... and he placed an "X" in magic marker through three of the red boxes ... apparently there is an unanticipated issue with the cabin filter. Another twenty-nine dollars are absorbed into the automotive ecosystem. Two hours later, Chet informs you that the check engine light was an anomaly - an oxygen sensor apparently threw a code but the "technician" cannot identify the problem and the oxygen sensor is working properly. So after they wash the car for you (retail value = $14.99) you can leave ... you'll part with $149 plus sales tax and an assurance from Chet that if the problem happens again, bring the car in and they'll address the issue free of charge. You never get to talk to the person who performed the actual work, do you? Do you even feel comfortable that the actual problem has been solved? Sure, you have a cold bottle of water and a granola bar in your possession, and your car has been washed. But you don't talk to the actual person who did the actual work. You talk to Chet. When you work with your vendor partners ... are you working with Chet, or are you getting to actually speak with Boris? Do you get to learn what actually goes into the "algorithm" that determines who your new customers are? Or are you given a sheet with red boxes ... better known as a "dashboard" in our industry? I keep running into challenging situations ... where my clients are working with Chet and they need to be working with Boris. Sure, my clients are getting granola bars and cold water and the occasional banana - but they need to have an honest discussion with Boris. If we're gonna "fix it", then we need to speak with Boris, don't you think? On Monday, I wrote about Amazon Prime Day. On Tuesday, I had a pretend discussion with Catalog Craig Paperman about Amazon Prime Day? Which discussion did you enjoy more? Which discussion resonated more with you? When you give me feedback at a conference (something you aren't shy about), you routinely tell me you enjoy hearing from Catalog Craig Paperman and that you enjoyed the old Gliebers Dresses series. In other words, you digest the message better when it comes from Catalog Craig Paperman than when it comes from me. Is there a parallel in your business? Is there a persona or employee with a unique voice/personality who could sell your message more effectively than a copywriter telling us that a suitcase is 19x15x6? Who is the person in your company who communicates with such passion that your customer base cannot wait for the next communication? A brief story - when I worked at Nordstrom, I had a team that swelled up to 24 analysts at one time. One of the very best analysts was not a great communicator - this person's ideas went nowhere, and my boss wanted the person fired ... saying once that if I didn't fire the person I should at least not let the person out of the cubicle area. Meanwhile, I had an analyst with below-average analytics skills and outstanding communication skills. Eventually I figured out that this person would be the public voice of my analyst community. This person spoke to other departments. And when this person spoke, things happened. Even I couldn't pull off what this person could accomplish - and I was a Vice President for crying out loud. The reason for this brief story? It's important "who" communicates your story. In my case, you digest issues much better when Catalog Craig Paperman communicates than when I communicate. Who is the person in your company who communicates with such passion that your customer base cannot wait for the next communication? And why the heck are you not paying this person a quarter-million dollars a year to be your version of "Flo" at Progressive Insurance? I know, I know, you have a hundred reasons why you cannot pursue this strategy. I'm asking you to consider just one reason why you should pursue this strategy. Yup, more business fiction for you - this is the stuff that is generally most popular, FYI. If this isn't your cup of tea, then how about reading this favorable article about Bonobos from September (click here) and then consider if they actually reinvented anything after becoming a division of Wal-Mart, ok? Kevin: Craig, you look like you forgot to bring antacid tablets on this trip. Craig: Oh, I'm just frustrated about Amazon Prime Day. Craig: It's yet another excuse for the customer to choose Amazon instead of catalogers who do things the right way. Craig: We celebrate the holidays that matter, like Cyber Monday. Kevin: A day when we have to give 40% off plus free shipping so that trade journalists can make money talking about how much profit we give away? Craig: Exactly! Look at the hair on my arms, standing at attention as I think about how exciting Cyber Monday is. Kevin: So you'd rather ride the coattails of the trade industry than create something innovative and exciting for your own brand? Craig: Who needs the stress of creating your own event, an event that has a 95% chance of failure? I'm at a stage in my career where I don't need failure. Kevin: You endured an entire career of failure. Craig: The first thirty years weren't that bad. There were a few good times. When we introduced credit cards as a form of payment, that was a lot of fun. Kevin: Were you at the front of the credit card movement? Craig: Oh heck no. We made sure somebody else took the risk and learned how to do it. Then we copied available best practices. That's how you earn a 4% cost of living increase, my friend. Kevin: And that's what you are doing with Amazon Prime Day - waiting to see how it works and once Prime Day is a best practice you'll create something on your own? Craig: Kind of like those Friends and Family Events. We waited until everybody had one. That's how you know an industry embraces a movement, and more importantly, that's how you know the customer embraces a movement. Kevin: Is it possible that by always being behind the curve, you miss out on valuable opportunities? Kevin: Name something that the catalog industry invented in the past five years that pushed the entire commerce industry forward? Craig: Cataloging is a mature industry. You don't invent anything in a mature industry. Well, let me take that back. Printers can do amazing things. They can create 80,000 different versions of a catalog. Think of the possibilities. Kevin: Do you think about the possibilities? Craig: My inventory manager couldn't possibly forecast how many units to sell because she wouldn't know what specifically is being sold on each page. Kevin: But your inventory manager has no idea what the online visitor will choose to look at, and somehow she figures out how to manage online inventory. Kevin: How is it different? Craig: I have no idea. Craig: Why can't we sell stuff without effort? That's all I'm looking to accomplish at this stage of my career. Kevin: Tell me you didn't just say that. Craig: Wouldn't it be great if we could have vigorous discussions about which cover photography is most likely to work on the August catalog? We could all offer our opinions, none of which really matter, and we'd kill two or three hours in the process! Then we'd go with a version that nobody likes and it wouldn't work and then we'd all criticize Liz about how she messed up the creative strategy for the mailing. It would be her fault! That's how I'd like to spend my time. Kevin: You like to spend your time criticizing Liz? Craig: Nonetheless, how much fun can you have personalizing a website when the customer can enter through one of a thousand different ways? Only the numbers geeks enjoy that stuff, and they're no fun to argue with. Craig: Because they have facts. Once somebody has facts, they aren't fun anymore. How do you debate somebody who has facts? They're right, you are wrong. That's why I don't like Amazon Prime Day. It works. They advertise. They get sales. Their business grows. There's nothing to discuss. Kevin: But I thought you were a follower who liked best practices? We just talked about letting people take all the risks. So you don't like best practices when best practices are fact-based, is that correct? Craig: I like it when you are told to offer a discount in the subject line of an email message. See, that's a best practice, but we can have endless discussions about the "right" way to execute the best practice, and there isn't a fact-based answer. Amazon Prime Day? It works, end of story. No fun there. Kevin: Amazon gets to have fun. They've created a fake holiday - their own personal Super Bowl. They get their sellers to promote the event for them (that's a low-cost / no-cost customer acquisition program). They advertise the "event" all over the place. TV commercials with corgis. Radio - you can't get away from it on radio. RADIO for crying out loud. You tell me you hate what Amazon is doing to your business. You know what they are doing? They are TRYING. If you want to see the future, look at what the folks in Sports and Politics are doing. They create "events", and they hype the living daylights out of the events. "TRUMP AND THE G20" ... that's an event, and it gives cable TV and talk radio pundits three days of endless (and pointless) content. Baseball has their All Star Game this week - there were weeks of discussion prior about who made the team and who "should have" made the team. Soccer has their Gold Cup that leads to next year's World Cup. NASCAR is building up to their Playoffs, which start in mid-September. Heck - your local weather person hypes the day ... "IT IS A TORCON 6 FOR AMES TODAY" and then it builds with a "Tornado Watch" and then the clouds build and darken and then there are SEVERE THUNDERSTORM WARNINGS and unfortunately the rogue tornado forms and the storm chasers are there to cover the carnage. Again, an event predicted in advance is hyped and covered. Amazon has Prime Day - and they're promoting the living daylights out of it. Explain why our industry just sits in place and grumbles that Amazon is taking over the world? I mean, at least they are TRYING something. Nordstrom generates Christmas-like sales from their Anniversary Sale, which begins momentarily. What is the event(s) you put all of your marketing muscle behind?